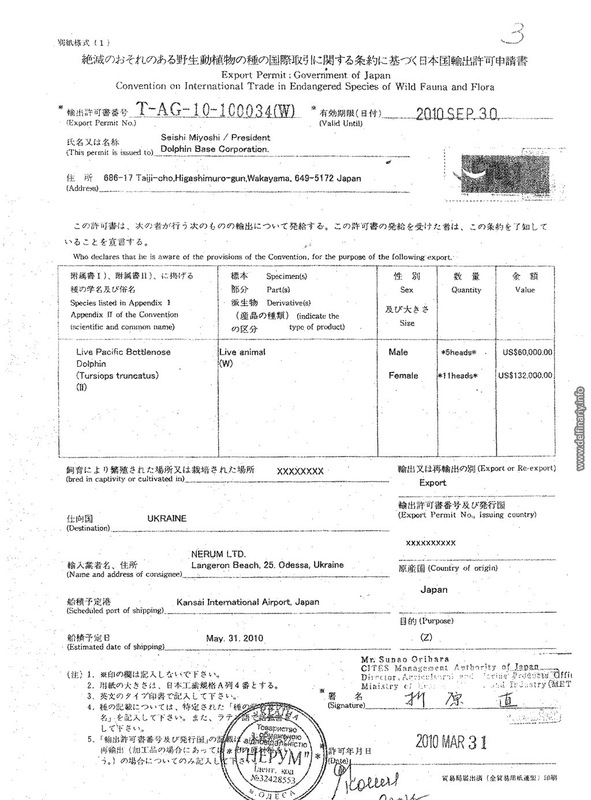 Op-Ed: Is NatGeo sponsoring company that purchases Taiji dolphins? Doha - A new temporary lease dolphin show run by Ukrainian company NEMO or Nerum LLC, is opening in Qatar. According to the show, National Geographic is sponsoring their endeavors, despite NEMO's import of dolphins captured in the Taiji dolphin drives. Based in Souq Waqif, Qatar Dolphin Discovery & Research has been posting the progress of dolphins-in-training on their Facebook page over the past several weeks. The new marine mammal display facility which states that it is aiming, "to entertain people of Qatar by attractive show and dolphins encounter," is being sponsored by the state's Ministry of Tourism. Dolphins from Nerum were first sent to Souq Waqif last February for a spring festival show. Now it seems the show will continue under the sponsorship of National Geographic, one of the largest nonprofit scientific and educational institutions in the world. 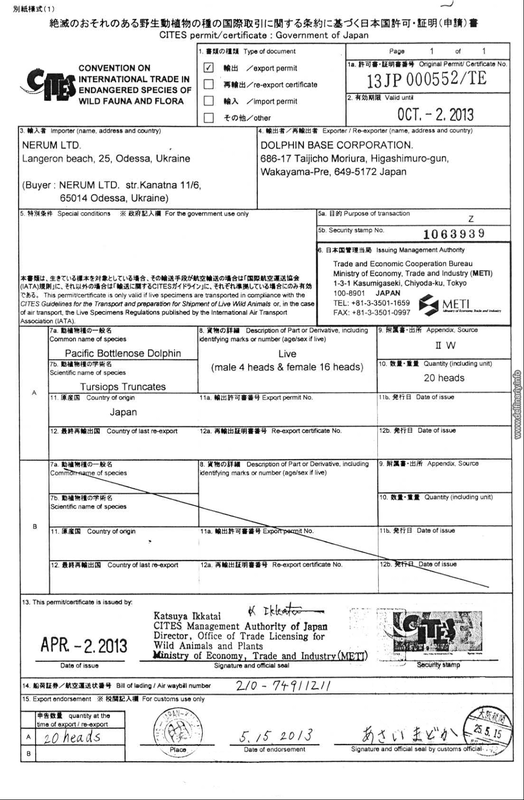 Given that Nero/Nerum LLC has purchased dolphins captured from the inhumane Japanese dolphin drives, the sponsorship by NatGeo is a surprising one for many. Even more recently, just last May in fact, Nerum acquired another 20 Pacific Bottlenose from the same facility, as this CITES permit shows. The company accepted delivery of a further 16 female and 4 male Pacific bottlenose dolphins. Pacific bottlenose dolphins and Dzhýla Kustó - were bought from the Japanese fishermen from the quota meant for cooking food in Japanese restaurants. Saved from death, dolphins ... got a second life. The Taiji dolphin drives which were featured in the Academy Award-winning documentary The Cove, run between September to March every year. Last year, according to CetaBase.com, 1,486 dolphins from six species were driven into the cove. Compared to earlier seasons, where up to 90 percent of the dolphins captured were slaughtered, around 58 percent of animals were killed last year. Due to increasing global demand from the captive industry, the number of cetaceans captured for public entertainment is increasing, while the slaughter percentage is decreasing. The largest purchaser of dolphins from Taiji is inevitably China, but in the last few years, new countries have also entered the picture. Thailand, Saudi Arabia; Egypt, Republic of Georgia and yes, the Ukraine, have all purchased dolphins from Japan for their aquariums. Last season, Isana Fisheries Union selected 156 bottlenose dolphins for captivity. If they sold all of them, it would net the union between six-seven million dollars. When compared to dolphin meat which sells for much less, about 2,000 yen (about US$16) a kilo, it is easy to see the dynamics of the dolphin drive shifting from sustenance to live sales. Dolphin Base, where the captive dolphins have been exported from, maintains and trains the dolphins captured in the Cove. The Base works directly with fishermen to secure dolphins for their own shows and for sale abroad. Trainers that work for the Base, are even ferried into the Cove via the fishermen. They then select prime specimens for captivity. Those dolphins not selected, are then horrifically slaughtered for meat. The slaughter is horrendous. The dolphins are killed individually by hand, in a method that involves repeatedly ramming a metal rod into the base of its head. After a recent analysis engineered by Whale and Dolphin Conservation, Dr. Andy Butterworth from the University of Bristol (UK) announced that this brutal killing method, "leads to significant hemorrhaging and likely paralysis, and results in a slow death through trauma and gradual blood loss." It is difficult to imagine therefore, how any conservation group could endorse any show or company that continues to promote these appalling methods. According to the non-profit group, National Geographic's aim is, "to increase and diffuse geographic knowledge while promoting the conservation of the world's cultural, historical, and natural resources." The Taiji dolphin season is again underway with a fisherman's quota of 2,013 animals. Just eighteen days into the season, 31 bottlenose dolphins have been seized for aquariums and two pods of short-finned pilot whales have been slaughtered. It is hoped therefore, that if NatGeo has sponsored a Nemo-run show, they will withdraw that sponsorship forthwith. Questions issued to the group on Monday about their involvement in Qatar Dolphin Discovery & Research, have yielded no response to date. Further data on where Taiji dolphins are being exported to is available in 'Tracking Taiji: Live Capture & Export Data from Drive Fisheries'. Update 9/19/13: Qatar Dolphin Discovery has now changed the parameters on its Facebook page. It is inaccessible by people from the USA and maybe even the UK, so the link provided earlier may no longer work. Further enquiries have also been sent to National Geographic requesting a statement. The National Geographic Society is unfamiliar with Qatar Dolphin Discovery & Research, and has not provided sponsorship support. Our name and trademark were used on their Facebook page without our knowledge or permission.